The 2018 August calendar has loads of special days! The following list is made up of August’s holidays, observances, food themes, awareness days , famous birthdays, science and historic based anniversaries, and more. So, if you want an occasion to celebrate, pick up some trivia, or add foods to your menu, this is the right place for you. And, of course you’ll find multiple opportunities for “on the calendar” themed studies for your classroom, homeschool, co-op/support group, or club. 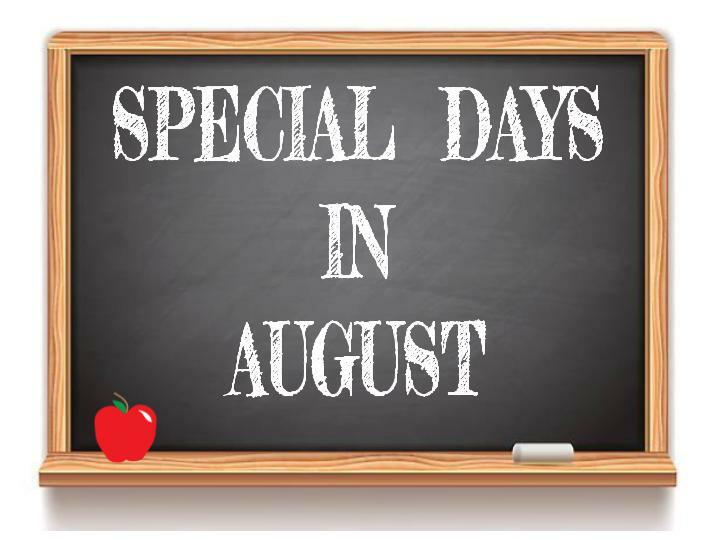 Resources for teaching throughout the month, including a free PDF of Special Days in August, can be found at the end of this list. August Resources for teaching and learning suggestions with August’s themes, holidays, and daily specials! My “Go-To” list of calendar based teaching resources for every month. I make my monthly Special Days lists by using several sources including old calendars, holiday books, newspapers, and the web. If you know of a special day that I do not have listed, please comment and let me know what it is so I can add it in. Below are the links to my favorite online calendar resources for August. This entry was posted in American History, birthday, Calendar, History, homeschool, lesson plans, My Family, Our Homeschool, Resources, Science, Special Days, teacher resourses and tagged American History, August, August Birthdays, August Food Themes, August Historical Anniversaries, August Holidays, August Special Days, August Themes, birthday, educational links, family, history, homeschool, kids, lesson plans, science, special days, teaching resources on July 26, 2018 by Betty Jo. This entry was posted in History, homeschool, Science, summer school, teacher resourses and tagged August 2015, August Birthdays, August Food Themes, August Historical Anniversaries, August Holidays, August Special Days, August Themes, homeschool, special days, teaching resources on July 25, 2015 by Betty Jo.